Most fish lay large numbers of eggs, ranging from several hundred to several millions for some species (e.g. an adult female cod can produce 4–6 million eggs in one spawning). For most fish the eggs are released directly into the water or attached to something (e.g. rocks or plants) in the water. The eggs are then fertilized by a male and then left to develop without parental care. The eggs hatch into larvae (called "fry") usually with a yolk sac still attached to them. The yolk sac continues to feed the larvae for a few days as they learn how to swim. After about a week to 10 days in this form, the fry mature into small fish. As very few species of fish produce “live” young or provide parental care for their offspring they need to produce large numbers of eggs. This means that some should survive predators, competitors and disease to reach maturity and to be able to breed. 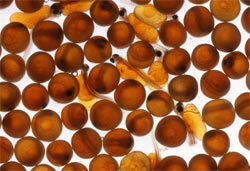 In hatcheries live foods such as microalgae, rotifers, brine shrimp, copepods and amphipods are fed to the fry. Fish eggs with some fish "fry"
Microalgae are single-celled species which exist individually, or in chains or groups and are a major part of plankton. Depending on the species, their sizes can range from a few micrometres to a few hundreds of micrometres (a micrometre is one millionth of a metre). They do not have roots, stems and leaves. Microalgae produce about half of the oxygen in the atmosphere through photosynthesis. There are between 200,000 and 800,000 species. Most rotifers are around 0.1–0.5 mm long. Some rotifers are free swimming and truly planktonic, others move along the bottom by first bringing the rear end of the body forward, forming a loop, then moving the front part of the body. Others are do not move, living inside tubes or gelatinous holdfasts that are attached to the bottom. Brine shrimp are small crustaceans growing to about one centimetre on average. experiments. They eat microscopic planktonic algae. Copepods are small crustaceans found in the sea and nearly every freshwater habitat. Many species are found drifting in sea waters as part of the plankton, but more are live on the ocean floor). They are usually the dominant members of the zooplankton, and are major food organisms for small fish, whales, seabirds and other crustaceans. Amphipods are crustaceans with no shell, they range in size from 1 to 340 millimetres and live in all aquatic habitats, and some moist terrestrial habitats.